What products can I order from smartphoto?? Where can I find all the product options? Which design should I choose? How many photos can I put in my Photo Book? How should I upload my photos? Will my photos be resized after the upload? How long does it take to upload images? What should I do if the upload fails? To start creating a photo book, I have to install Silverlight. What is this? Can I order different products at the same time? Do I have to create an account to be able to place an order? Is it possible to change my order after I’ve sent it through? Does smartphoto check the quality of your product(s)? Can there be a difference in the print quality of my images and the quality on my screen? Can there be a difference in colour between my images and an enlargement of the same images? Where can I find the different formats and prices of the products? Do the prices mentioned include VAT? What products can I order from smartphoto? All our products are listed in our products overview page. Click on the ‘Products’ tab to see the product categories. We offer the following: Photo Books, Fun Ideas, Canvas – Solid Poster – Poster collage, Cards, Calendars, Prints – Posters. Product details, such as formats, prices, options, etc. are found on the product page. 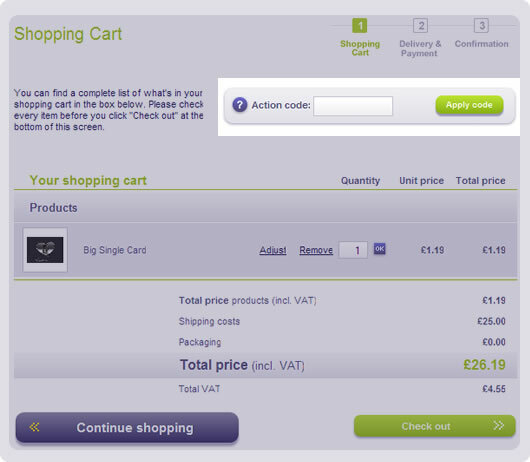 The ‘Options’ tab on each product page contains all the information you need about the available options. Options are offered for the following product categories: Cards & Photo Books. These options can only be ordered with the purchase of your product. With a wide range of products and over 120 different designs for each one, you can be as creative as you want to be. Click on your design choice to confirm or browse a wealth of design options by changing your selection on the left hand side. Check out our Occasions & Recommendations pages for your special requirements: these pages can be found on the right hand side of the Product overview page (click on the ‘Products tab’). Every Photo Book has a standard number of pages. If you have more photos, just add more pages. As an alternative, you can change the layout of your Photo Book. For example, instead of 1 photo per page, why not have 6? The standard number of pictures for each Photo Book is given on the dedicated product pages. You can upload JPG (JPEG) and PNG files to our photo services. JPG is a file format that enables high quality images to be saved as relatively small files. We do not accept other formats because we cannot guarantee that the results will be of a sufficiently high standard. You have to upload more than 10 photos? Use the smartphoto Image Uploader. This is a small program you have to install on your computer. With this program you can see the photos on your computer and select the ones you want to upload. You have to upload less than 10 photos? Use the Single image upload method. When you upload photos to order Prints or to create a Photo Book, we will resize the photos while uploading. They will be big enough to create the chosen product without quality loss, and the upload will be much faster. The time necessary to upload images depends on the size of the images and the speed of your internet connection. Loading larger files might take a while. Many companies block the installation of Active X and Java files. Try to upload the photos from another computer, or use the Photo by Photo method. Silverlight is a small Microsoft program that will be installed on your computer. Other websites use it too. It is 100% secure. ExtraFilm has many other products on the website which you can combine in one order. 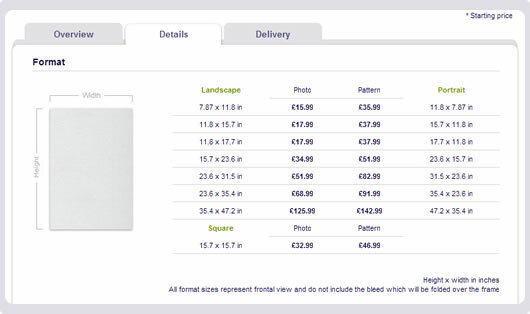 To purchase smartphoto products we need certain details such as your name, address and e-mail. This information is essential to the correct transfer and receipt of your order. You cannot make any changes to your order after sending it through. Grouping different orders is not possible either. If you go to the ‘My Account’ section of the website, you can click on ‘My orders’ in the top left menu. There you get an overview of all your orders and the status they are in. You type your discount code in the “Action code” slot in your shopping cart. To activate the code simply hit the “Apply code” button. You cannot combine 2 different codes. If the offer, which is attached to the code, is a discount in quantity (2 for 1, 3 for 2 etc) you must also change the number of products in your basket manually. You do this by typing in the correct amount of products and hit the “OK” button. smartphoto does not take any responsibility, after a purchase has been completed, for discount codes that have been wrongly used. Your product is based on the information you send us. The pictures are finished as naturally as possible. Please keep in mind that computer screens are not usually calibrated and that there can be a difference between an image on the screen and the actual files. Pictures are printed on our specialised photo printers. Our enlargements are printed on a different type of printer with a different type of paper, which can lead to minimal colour differences. How can I be sure that no part of my photo will be missing on my product? 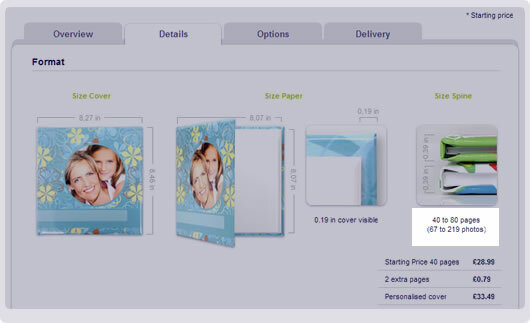 At the create stage of your product you can place one or more photos on a product. You will see a red dotted line around it. The part outside the red dotted line could be cut off during production. 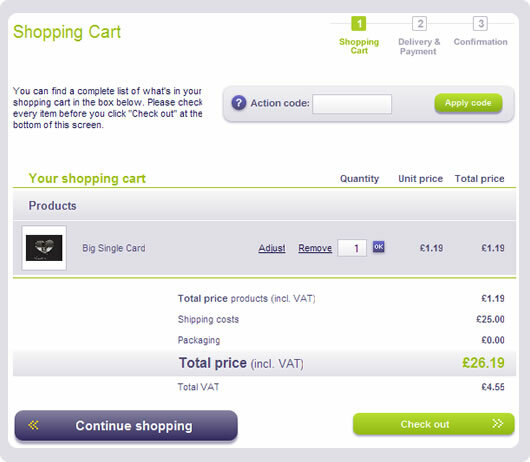 Click on the Details tab of a product page to see the different formats and the corresponding prices. You can also find an overview of this on the pricelist. There are several quantity discounts that depend on the product. You will find an overview of the different products with their prices and quantity discounts on our pricelist. Yes, all of our prices are inclusive of tax. You can see the amount of tax included in the price of your product in the Shopping Cart. The ‘Total VAT’ is also mentioned separately, for your information. How can I use my action code(s)? What should I do if my action code doesn’t work? Can I still apply my action code after ordering a product? All orders can be paid for by Visa, MasterCard or Pay pal. The entire payment is handled by an external company, Ogone (see www.ogone.be). Ogone specializes in secure payment transactions. All data is transmitted using high encryption standards to ensure a safe transaction. None of your credit card data is stored on our servers. Create your product(s) and click on ‘Add to Shopping Cart’. Enter your Action Code and click on “Apply code”. Below you will see your discount amount in green next to Discount (action code). The code is only applicable to the product(s) and quantity mentioned in our promotion. Action codes are not cumulative. Every action has its validity date mentioned. Some codes only function on the partner sites and others only on our website. Some codes are only for new customers or can only be used once. You can find all the necessary information about these specifications in the legal text located at the bottom of the e-mail that provides you with your action code. Unfortunately not. You cannot alter your order after it has been dispatched to us. However, the action code may still be used for your next order. Please note that action codes have an expiry date. What should I do if I only received a part of my order? Where can I find the different production and delivery timings? What should I do if my address input is not accepted? What should I do if I specified an incorrect delivery address? Can I order a product and have it delivered to friends? Can I deliver to friends abroad? Where can I find information about the shipment costs? What are the shipment costs when you order different photo products? What if my received order does not correspond to the product(s) I ordered? We dispatch each part of your order as soon as it is ready. This means that you may receive your order in separate parcels. The detailed order overview will be added to the last package sent to you. The last tab on every product page is the delivery tab. Here you will find specific production and delivery timings. You can also find this information in the Pricelist. Please check that you filled in all the necessary fields correctly. It is possible that you forgot to fill one in, or that you missed a number. Unfortunately, it is not possible to change anything once you have sent through your order. Your order will be delivered to the address you filled in. 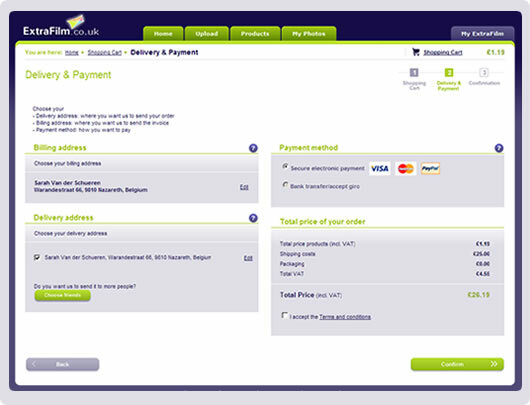 When ordering a product, the final step is to confirm your billing and delivery address on the delivery & payment page. If you want to send your order to other people, you can click the ‘choose friends’ button. 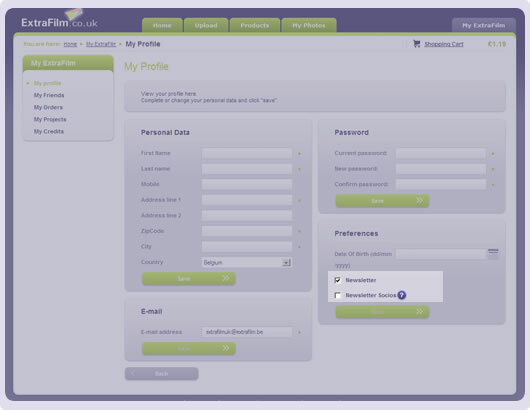 You can add or select friends as well as their personal data. 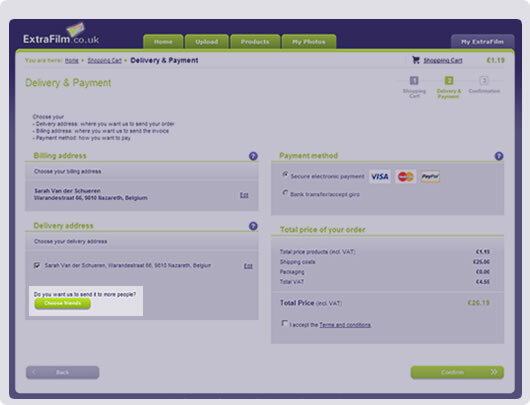 Click continue and you will return to the delivery & payment page. There you can still change or (de)select a specific delivery address. ExtraFilm can deliver to customers abroad, but it is generally advised that you go to the website serving the country concerned. This is a faster and less expensive solution. You can consult the list of countries at the bottom of the page. The last tab on every product page is the delivery tab: here you will find the specific shipment costs. You can also find this information on our pricelist. You only pay shipping costs for those products in your shopping cart with the highest shipping category. This means free shipping on all other products from lower categories included in your order. You will find an overview of all the shipment charges on our local pricelist. If your ordered product does not correspond to the product you received, you should contact your customer services by e-mail within 7 days of receipt of your order. But please make sure you have all the required information before sending your e-mail. Customer services can only confirm the error if you provide the following: your customer and order number, the reason for your complaint and photographs of damage where relevant. How do I register and create my account? Where can I (un) subscribe to the newsletter? How does ExtraFilm protect my personal information? Can I rename an album? Can I move photos from one album to another? Can I share my album(s) with friends? You can create your own account by filling in the Registration page. If you forget your password you can click the link ‘forgot password’ on the bottom of the registration page. Fill in your e-mail address and an e-mail will be sent to you with your password. - You have the option to subscribe when you register on our website. - You can choose to unsubscribe by deselecting the option at the bottom of our newsletter. We require specified information from you, such as your name, address and e-mail, in order to be able to offer our services. We use this information to transfer your orders and to send you information on our new products and services. Your personal data is very important to us: we do not share your details with other companies and we fully respect and protect your privacy. Please take a look at our Conditions page for more information. To rename one of your albums you simply activate that album and click ‘Rename Album’ on the right hand side of the page. To move images from one album to another simply open an album, select the pictures you want to move and click ‘Move Photos’. You will be asked to select the destination album. 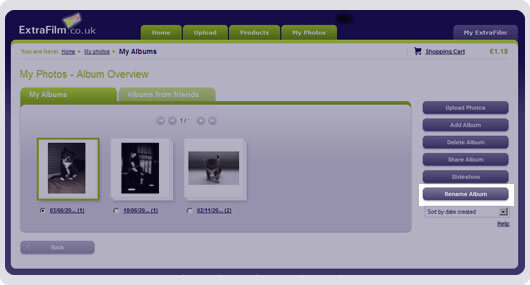 To share an album with friends simply select the album and click ‘Share Album’ on the right hand side of the page. After selecting ‘Share this album’ you will have to select or add friends. Your friend(s) will receive an e-mail with a link to your album. 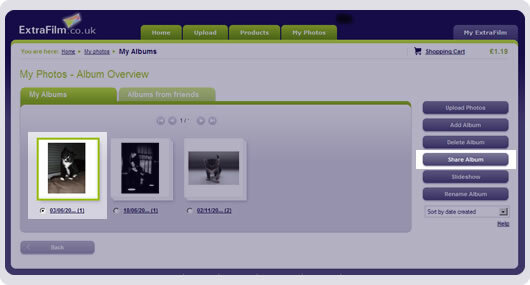 They will be able to see your album/photos after registering on the website. Why do my images have to be RGB and not CMYK? How many pixels does my image need to have? How do I know if my file has the correct resolution? What do the aspect ratio 2:3 and 3:4 mean? Traditional or digital format? Your pictures have to be RGB images because we only work with JPEG files and JPEG uses RGB. If you are planning to order prints of digital images, then please keep in mind that larger files take longer to upload while not necessarily resulting in a better image quality. The difference in quality can be unnoticeable as long as you start with a minimum amount of pixels. You will be warned if an image does not have the correct resolution while you are creating your product. A small yellow triangle with an exclamation mark in it INVALID TAG: will appear if your image has a resolution that is too low. If the resolution is fine, you will not see a triangle. Depending on the picture used in your product, a warning will be shown if you include an images that doesn't have the correct resolution while creating your product. Some of our Photo Books can be finished with a glossy lamination, This gives your pictures even more contrast and color depth. The image format is ¾ for the majority of digital cameras. The format is 2/3 for a classic analog camera or a digital reflex camera. If you want your digital image printed in the 2/3 format, then please select ‘Reframing’. Keep in mind that selecting this option will result in your image being trimmed. If you edit/alter your images with software such as Photoshop before you order, the prints may be sent to you in different formats (square, panoramic, etc).